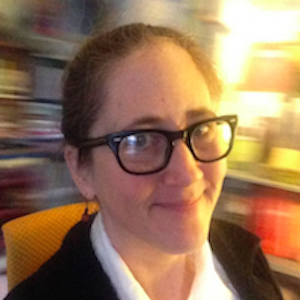 There were 2 posts published in May 2017. I have a lot of birdfeeders, maybe too many. We all know that the cat to person ratio you are allowed is N+1 (you can have one more cat than person in your house otherwise you risk veering into Crazy Cat Person territory; not judging, this is just math). I’m not sure what the birdfeeder ratio is but I think I’ve passed it. I have a few hanging “squirrel proof” feeders, a suet feeder, and two window feeders. All of these are visible from my office. 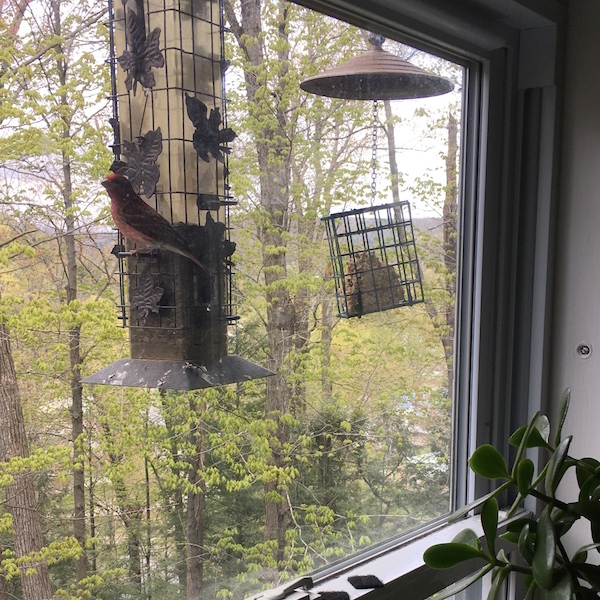 There is another feeder hanging off my porch and a finch feeder that no one seems to like. All of these are full of prime sunflower seeds because I am a lady with a job and the birds all seem to hate millet anyhow. In fact I was concerned that they might hate ME because they were scarce a lot of last year. I did the feederwatch so I could see my numbers dwindling. I chalk this up to some ancient birdseed Ronni gave me, an owl that was lurking, and hey it was pretty cold out. The leaves suddenly came out on to the trees this week. Which means birdwatching has taken a few sudden turns as well. 1. I can’t see all the birds all the time, and they can sort of sneak up on the birdfeeders, and lurk. So I see more birds because there are more around, but I also can hear birds I haven’t even seen yet. The trees are ripe with bird possibilities. 2. Everyone is starving, you’d think. 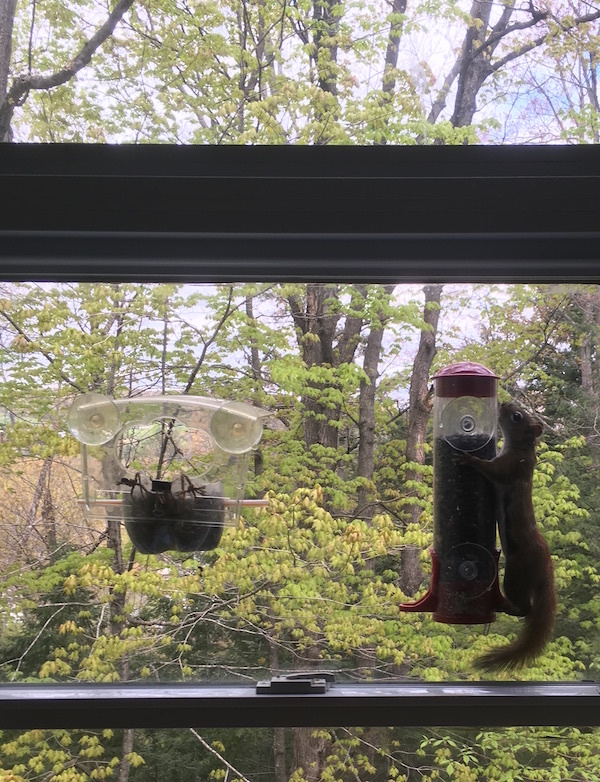 This momma red squirrel is going after my feeders like it’s an Olympic sport. She sits in the windowsill and chitters at me. I think I’ve found the right weird set of noises to respond with because I can make her growl when she’s in a nearby tree. I think we have a relationship. She probably thinks I am coming to take her babies. 3. All new birds have shown up this week that I haven’t seen all winter. Aside from the usual suspects–chickadees, nuthatches (both kinds), goldfinches, juncos, titmice, woodpeckers and and cardinals–this week has also delivered rose-breasted grosbeaks, blue jays, purple finches, house finches, and starlings. And they’re all sort of chummy with each other, spending more time hanging out rather than just grabbing seeds and heading back into the trees. Watching the birds for me is calming. Even the squirrel’s frantic machinations are calming. They don’t know who is president. They have some fairly simple concerns. They make nice noises and are pretty. They’re a reminder that the natural world is still somewhat functional. Whoops, I missed April. I had a headcold. Unlike the one last time, this one lasted a few weeks. I blame sleeping in the same room as a hamster. Since last time I’ve done some more traveling and am in an extended period of being at home. Well, except for maybe going to MA this weekend but that’s another sort of home. After I travel I usually upload sets of photos to Flickr. I do this despite all the reports of Flickr being basically adrift with a very small staff and a parent company which has been bought by an even more who-cares parent company less than a year ago. I don’t care, I’m going to keep putting photos there until I stop being able to. One of my photos, the one you see above, actually made Explore. Explore is a thing, algo based I think, where images that are some sort of popular show up. There’s a new Explore every day. A lot of people look at Flickr to just see nice photos and so if a photo “makes Explore” it suddenly gets more traffic. This was true back in the day and it’s still true now. The photos do have a bit of samey-ness to them but it’s still a good place to go look at some neat photos in an ad-free environment. I was surprised that this photo made the cut though. 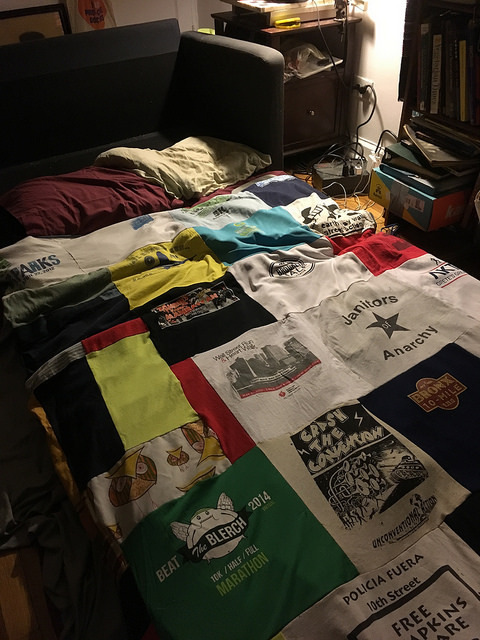 I mean I think t-shirt quilts are cool but I didn’t think they hit some sort of zeitgeist. A trip to MA via Funspot. Jim and I played video games until we were a little sick of them (and hungry) and then I went and read a book on a friend’s couch for days as my sinus infection subsided. A really glorious trip I took to Windsor Vermont (on my way home from an early-for-Jessamyn Saturday meeting) where I found this great nature trail and enjoyed getting exercise and breathing through my nose. Also I looked at some weird stuff at their local dented can store: Mister G’s. So, not much to say but a lot for people to look at. Things are good. Spring is mostly here. I am mostly better and staying put for a little while.